Christmas came early for me and my family this year as my little sister, Mrs T, is about to have a baby. So yesterday we gathered together to share the Christmas spirit and we each brought something to laden the table. The boys were in charge of drinks, Mrs T offered to make her sticky ginger glazed ham, Ms L a caramelised onion tart and salads and I was in charge of dessert. 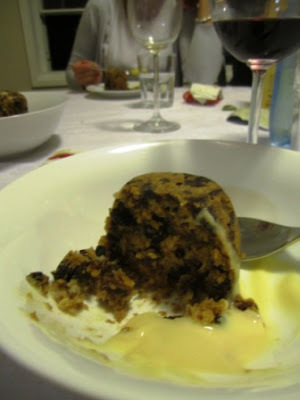 Normally at this time in Australia its gloriously hot and sunny however this year we've been treated with rain and cool weather....which is perfect for an indulgence of Christmas pudding. So with a little inspiration from my friend Michelle Southan's recipe in this month's Woolworth's Australian Good Taste I set out to make pudding. For my little version I twisted the recipe by using raisins, dates, prunes and currants, a good slosh of Frangelico and a little dash of Kahlua and added a little Christmas spice. I also soaked the fruit the longer than Michelle's as I like to really infuse the flavours however if you haven't got time it will still taste delicious even if you just soak it for a few hours. What resulted was a divine little dome of pudding with a rich buttery texture, sweet slightly nutty flavour and the warming spices of cinnamon, allspice and nutmeg giving me another dessert success. Everyone loved them ....so much so that I didn't even get time to take a proper picture as everyone had started to devour them already! May you all have a delicious Christmas and a 'bubbly' New Year! Combine the raisins, dates, prunes and currants in a large bowl. Pour over the Frangelico and Kahlua. Stir to combine. Cover with plastic wrap and set aside in a cool place for 12 hours. Preheat the oven to 160C (140C fan forced). Grease twelve 2/3 cup ovenproof pudding dishes or dariole moulds with melted butter. Line the bases with non-stick baking paper. Place the butter and brown sugar in the large bowl of an electric mixer. Beat on medium speed until pale and creamy. Add the eggs, one at a time, beating well after each addition. Sift the plain flour, self raising flour, cinnamon, nutmeg and allspice in a bowl. Stir in the breadcrumbs. Add to the butter mixture and stir until just combined. Add to the fruit mixture and stir until just combined. Divide the pudding mixture among the prepared dishes. Cut twelve 13cm squares of non-stick baking paper and twelve 13cm squares of foil. Place each paper square on top of one of the foil squares and then fold to make a little pleat in the centre. Place each square, foil side up over the puddings. Tie a piece of kitchen string tightly around each pudding mould. Place the pudding moulds in a large roasting pan. Pour enough boiling water in the pan to come halfway up the sides of the pudding moulds. Bake for 45 minutes or until when a skewer inserted in the centre in comes out clean. Remove foil and paper. Turn onto individual serving plates. Serve drizzled with custard.